This article is about the song. For the 1942 musical, see When Johnny Comes Marching Home (film). A June 1898 recording of the patriotic song, made during the Spanish–American War. "When Johnny Comes Marching Home" (sometimes "When Johnny Comes Marching Home Again") is a popular song from the American Civil War that expressed people's longing for the return of their friends and relatives who were fighting in the war. 3 "Johnny Fill Up the Bowl"
The lyrics to "When Johnny Comes Marching Home" were written by the Irish-American bandleader Patrick Gilmore during the American Civil War. Its first sheet music publication was deposited in the Library of Congress on September 26, 1863, with words and music credited to "Louis Lambert"; copyright was retained by the publisher, Henry Tolman & Co., of Boston. Why Gilmore chose to publish under a pseudonym is not clear, but popular composers of the period often employed pseudonyms to add a touch of romantic mystery to their compositions. Gilmore is said to have written the song for his sister Annie as she prayed for the safe return of her fiancé, Union Light Artillery Captain John O'Rourke, from the Civil War, although it is not clear if they were already engaged in 1863, as the two were not married until 1875. Gilmore later acknowledged that the music was not original but was, as he put it in an 1883 article in the Musical Herald, "a musical waif which I happened to hear somebody humming in the early days of the rebellion, and taking a fancy to it, wrote it down, dressed it up, gave it a name, and rhymed it into usefulness for a special purpose suited to the times." The melody was previously published around July 1, 1863, as the music to the Civil War drinking song "Johnny Fill Up the Bowl". 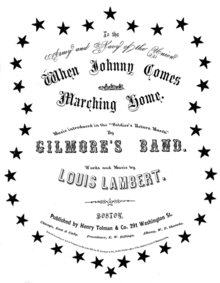 A color-illustrated, undated slip of Gilmore's lyrics, printed by his own Boston publisher, actually states that "When Johnny Comes Marching Home" should be sung to the tune of "Johnny Fill Up the Bowl". The original sheet music for "Johnny Fill Up the Bowl" states that the music was arranged (not composed) by J. Durnal. There is a melodic resemblance of the tune to that of "John Anderson, My Jo" (to which Robert Burns wrote lyrics to fit a pre-existing tune dating from about 1630 or earlier), and Jonathan Lighter has suggested a connection to the seventeenth-century ballad "The Three Ravens". "When Johnny Comes Marching Home" is also sung to the same tune as "Johnny I Hardly Knew Ye" and is frequently thought to have been a rewriting of that song. However, "Johnny I Hardly Knew Ye" was not published until 1867, and it originally had a different melody. "When Johnny Comes Marching Home" was immensely popular and was sung by both sides of the American Civil War. It became a hit in England as well. Quite a few variations on the song, as well as songs set to the same tune but with different lyrics, have appeared since "When Johnny Comes Marching Home' was popularized. The alleged larcenous tendencies of some Union soldiers in New Orleans were parodied in the lyrics "For Bales", to the same tune. A British version appeared in 1914, with the similar title, "When Tommy Comes Marching Home". The 1880 U.S. Presidential election campaign featured a campaign song called "If the Johnnies Get Into Power". Illustration of a Zouave company on Civil War era broadside of "When Johnny Comes Marching Home". "Johnny Fill Up the Bowl"
"Johnny Fill Up the Bowl", which provided the tune for "When Johnny Comes Marching Home", was a topical drinking song that commented on events in the American Civil War. It was frequently refitted with new words by soldiers and other publishers. A satirical variant of "Johnny Fill Up the Bowl", entitled "For Bales" or, more fully, "For Bales! An O'er True Tale. Dedicated to Those Pure Patriots Who Were Afflicted with "Cotton on the Brain" and Who Saw The Elephant, was published in New Orleans in 1864, by A. E. Blackmar. The children's songs "The Ants Go Marching" and "The Animals Went in Two by Two" ('Into the Ark')" re-used the tune and the refrain. The Pittsburgh Pirates organ player would play the song, each time second baseman Johnny Ray would come to bat. In Finland the tune is known as "Kapteeni Koukku" (Captain Hook), a children's song with lyrics by Keijo Voudinmäki, and most recently recorded by the Finnish children's music band Hevisaurus on their album Jurahevin kuninkaat [fi]. United States soccer fans sing the chorus to this song during matches as a patriotic hymn to support their national team. The song or its melody has also been used in many movie soundtracks, including Cavalcade, 1933; Gone with the Wind, 1939 (a Confederate military band plays it in the background of a scene taking place in Atlanta); The Great Dictator, 1940; Yankee Doodle Dandy, 1942; ‘’The Red Badge of Courage’’, 1951; Stalag 17, 1953 (it is sung by American prisoners of war); The Horse Soldiers, 1959 (the phrase "we'll all feel gay" is changed to "we'll all raise hell" when Johnny comes marching home); How The West Was Won, 1962; Dr. Strangelove or: How I Learned to Stop Worrying and Love the Bomb, 1964; Run, Man, Run, 1968; The Crazies, 1973; Monty Python and the Holy Grail, 1975; Born on the Fourth of July, 1989; Joe Versus the Volcano 1990; Die Hard with a Vengeance 1995; The Second Civil War, 1997; Antz, 1998; and The Majestic, 2001. The Clash used the melody and some of the lyrics for their song "English Civil War" on the Give 'Em Enough Rope album. Jacob Miller used the melody for his song "Peace Treaty", which was written for the One Love Peace Concert in Kingston, Jamaica, on April 22, 1978, to celebrate a peace treaty between the opposing leading parties. The melody of When Johnny Comes Marching Home can be heard in the fade out of the song Out in the Fields by Gary Moore and Phil Lynott (1985) played on keyboard. The song has an anti-war theme. It is used as the ending theme for the OVA series, Black Lagoon: Roberta's Blood Trail. An instrumental rendition was featured in the 2015 anime movie Girls und Panzer der Film. The melody is used in a section of the Georgetown University fight song. The Dropkick Murphys recorded their own version of the song, titled “Johnny I Hardly Knew Ya,” using old Irish lyrics to the song’s beat. Morton Gould's classical arrangement "American Salute" of the song (1943). Harris, Roy (1934), When Johnny Comes Marching Home — An American Overture . The Andrews Sisters, a "Swing Era" sister act sang an upbeat "swing" version in the 1940s. British pop singer Adam Faith sang a version titled "Johnny Comes Marching Home," used over the opening and closing title credits for the British crime thriller Never Let Go (1960). This version was arranged and conducted by John Barry. Another version was released as a single, reaching No. 5 in the UK Singles Chart. A French version (without vocals) "Johnny Revient d'la Guerre" was recorded by Bérurier Noir, on the album Macadam Massacre (1983). ^ Peterson, Patti Jo (August 30, 2007). "The House that O'Rourke Built". The Plattsmouth Journal: 5. ^ Peterson, Patti Jo (June 15, 2006). "=The O'Rourke House". The Plattsmouth Journal: 11. ^ a b Lighter, p. 19. ^ Lambert, "When Johnny Comes Marching Home". ^ "For bales" (PDF). Lcweb2.loc.gov. Retrieved 12 October 2017. ^ "The Ants Go Marching". Kids Environment Kids Health. National Institute of Environmental Health Sciences. Archived from the original on 2016-06-23. Retrieved 2016-05-20. ^ "Fono.fi - Äänitetietokanta". Fono.fi. Retrieved 12 October 2017. ^ "2006 World Cup - Nuremberg". YouTube. 2006-07-30. Retrieved 2012-03-14. ^ "Girls und Panzer Der Film- Original Soundtrack set for release on November 18, 2015". Infinitemirai.wordpress.com. 5 November 2015. Retrieved 12 October 2017. ^ Roberts, David (2006). British Hit Singles & Albums (19th ed.). London: Guinness World Records Limited. p. 192-3. ISBN 1-904994-10-5. "When Johnny Comes Marching Home" , John Terrill (E. Berliner's Gramaphone (1893)—Library of Congress Performing Arts Encyclopedia. "When Johnny Comes Marching Home" (Overview Page—Library of Congress Performing Arts Encyclopedia. "When Johnny Comes Marching Home" (Sheet Music), Oldroyd, Osbourne H. The Good Old Songs We Used to Sing, '61 to '67, —Project Gutenberg.